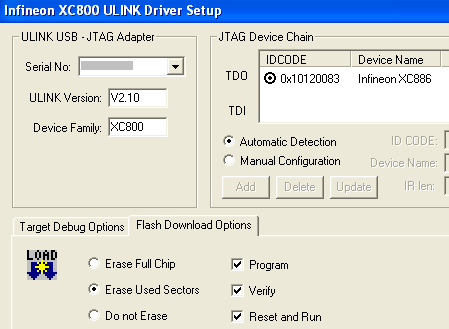 The Target Driver Setup dialog configures the JTAG bus interface as the debugger or for Flash programming as described below. Serial No specifies the serial number of the currently connected and selected ULINK USB-JTAG adapter. If multiple ULINK adapters are connected to your PC, then you need to select the serial number of the ULINK interface that you want to use for debugging or flash programming. The ULINK Version shows the version number of the ULINK Windows system driver (KeilUL.SYS). It must show version 2.00 or higher. The Device Family must show the XC800 family series. This window displays all the JTAG devices which are connected to the ULINK adapter. Multiple JTAG devices can be chained. The device which is directly connected to ULINK's TDI line is at the bottom of this list. If there is more than one JTAG device in the chain, then select the device before debugging or Flash programming it. Device is selected for debugging or Flash programming. If the listed device has no or , it is not XC800 compatible and cannot be selected. Automatic Detection scans the JTAG devices of the JTAG chain. If the device list does not match your target system (since the JTAG device is not plug-and-play), you need to select Manual Configuration. Manual Configuration requires manual specification of all device parameters in the JTAG chain. Add a new device with the current ID Code, Device Name and IR (instruction register) len. Delete a selected JTAG device. Update a selected JTAG device with the current ID Code, Device Name and IR len information. The Move Up and Down buttons change the position of a selected device in the JTAG Device Chain.